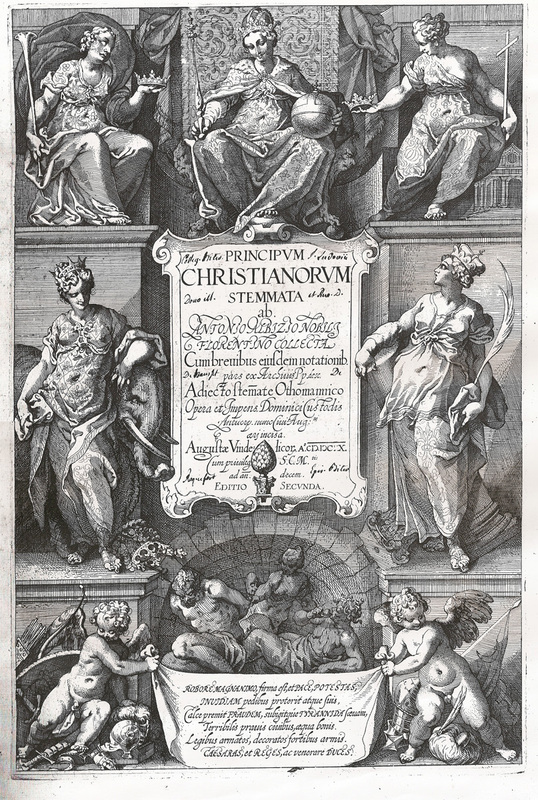 Antonio Albizzi, "Principum Christianorum Stemmata", 1610. 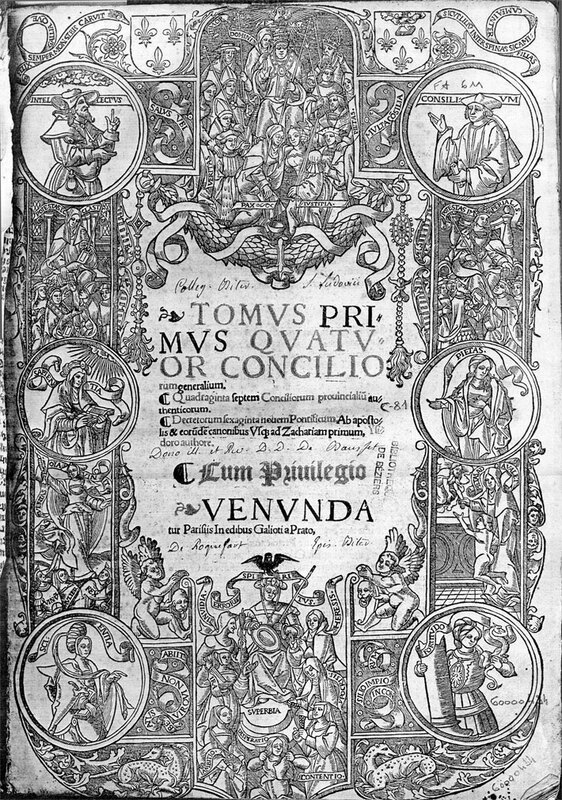 Jacques Merlin, "Tomus Primus Quatuor Conciliorum Generalium", Paris, 1524. 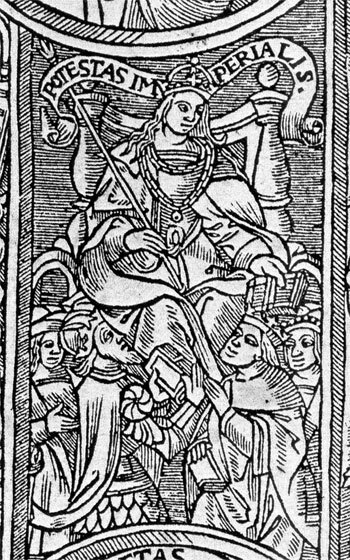 Personification of the Church and Empire, from the Acta Sanctorum (Bollandist), July, vol. 5.
your loving people: hold us. O widowed consort, protective regent. and ambitious sons, however unworthy. an exile on the island of Lesbos. "be content to reign.." Are you thinking of anyone in particular? It didn't help Bona of Savoy. "beware nobles..." Anyone in particular? Good advice for Bona of Savoy. "...an unfed people..." Well, yes, Marie Antoinette was descended from empresses. "...ambitious regent..." Plenty of those. "Joan.." Who is this? Pope Joan is all I can think of, but that's a different card. "Irene...Lesbos..." St. Irene of Lesbos? And Ross: What year is your "personification of church and empire" picture? The Acta Sanctorum started being published in 1643; is it older or later than that? And the circle divided into three: is that the three continents, Europe, Asia, and Africa, as I have sometimes seen the parts labeled, I think by Durer? mikeh wrote: And Ross: What year is your "personification of church and empire" picture? The Acta Sanctorum started being published in 1643; is it older or later than that? And the circle divided into three: is that the three continents, Europe, Asia, and Africa, as I have sometimes seen the parts labeled, I think by Durer? 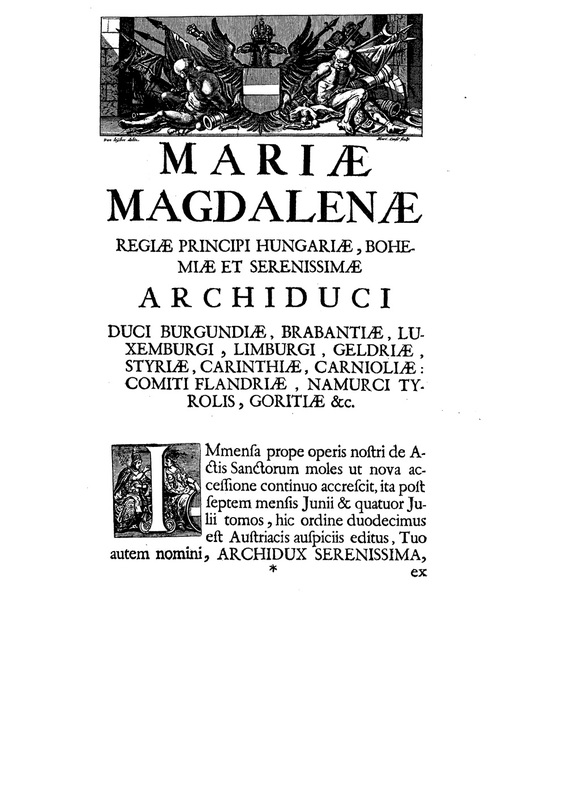 Volume 5 of the month of July was published in 1727, and this volume was dedicated to Maria Magdalena, Archduchess of Austria (1689-1743). She was the sister of Emperor Charles VI (1680-1740). According to this wikipedia page (which I have no reason to doubt), "She lived a life of seclusion and remained unmarried and died with out issue." 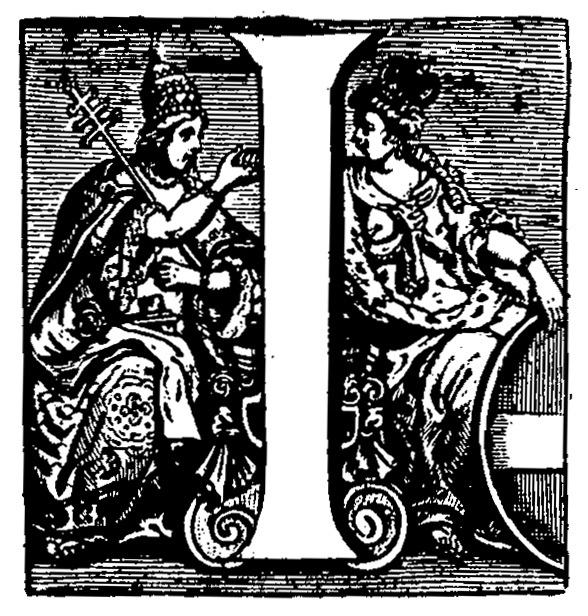 I assume that the engraving was made for the book, since the "Empress" holds the white-banded shield of the family. The "T-globe" - indicating as you said the whole world - is at least medieval. It may be more ancient (Carolingian? Byzantine? ), but I don't know. It remained, obviously, an iconographic standard even after the discovery of the New World. The first known Empress is that of the Cary-Yale, a card which I presume existed in some form during the reign of Filippo Visconti. She has on her lap a shield with the single eagle of the Holy Roman Empire, which Huck tells us was replaced by the double eagle in 1433, although the Emperor continued to use the single eagle because he had other titles (viewtopic.php?f=23&t=387#p8596). Filippo could proudly display this eagle as hereditary Duke, a status bestowed on his father by Wenceslaus in 1395 (http://en.wikipedia.org/wiki/Wenceslaus ... the_Romans). The CY Empress looks young and beautiful. Possibly she is Barbara von Cilli, the wife of the emperor who adopted the double eagle, Sigismund. 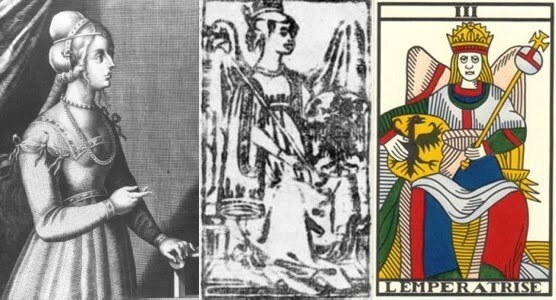 Here is a composite of pictures of her, taken from Wikipedia, alongside her portrait and the eagle shield on the card. "Dracul" is "dragon" in Hungarian (or is it Romanian). I can't see the "deus propicio"; nor do I know its significance. Wikipedia calls Barbara von Cilli an "atheist" and repeats stories about her "harem of lovers" after her separation from Sigismund. Nonetheless, she was crowned Empress in 1433. Whatever the truth, it is clear that if it is her on the card, she would likely have been put there--not the actual Cary-Yale surviving card, but some predecessor-- before Filippo got wind of such charges, clearly before 1437 and probably before 1433, when Filippo failed to meet her husband Sigismund when he was in Milan for his crowning at S. Ambrose. I have speculated on the why and what of a predecessor deck on the Emperor thread, Either it was something like the Cary-Yale; or it was an "imperator" deck, about which we know only of their existence, from account records and letters, and nothing else; or it was something in between. Another possibility, if as mmfilesi gives some tentative suggestions (viewtopic.php?f=23&t=387#p8597), the CY Emperor is really Filippo himself, is that the Empress is Maria of Savoy, Filippo's wife. But I don't know what she looked like. I would expect to see her in the frescoes at Monza, but I don't know who it would be. Early decks in other cities are conspicuous both for their lack of extant Empresses and for a lack, even on Emperor cards, of stylized imperial eagles. I have elaborated on this point at viewtopic.php?f=23&t=387#p8593). The shield, I think, is the single most important thing on the Milanese Empress card. She is nothing if not the representative of the Empire, and hopefully mother of the future emperor. 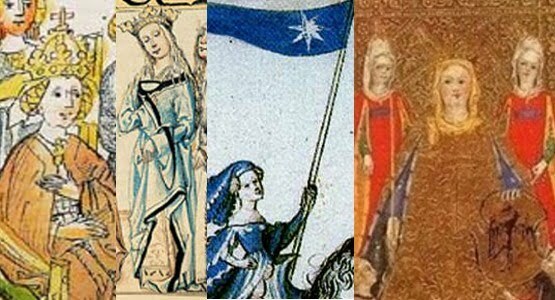 The latter role is clear from her green sleeves on the PMB: to provide fertile pleasure for the Emperor (http://en.wikipedia.org/wiki/Greensleeves). 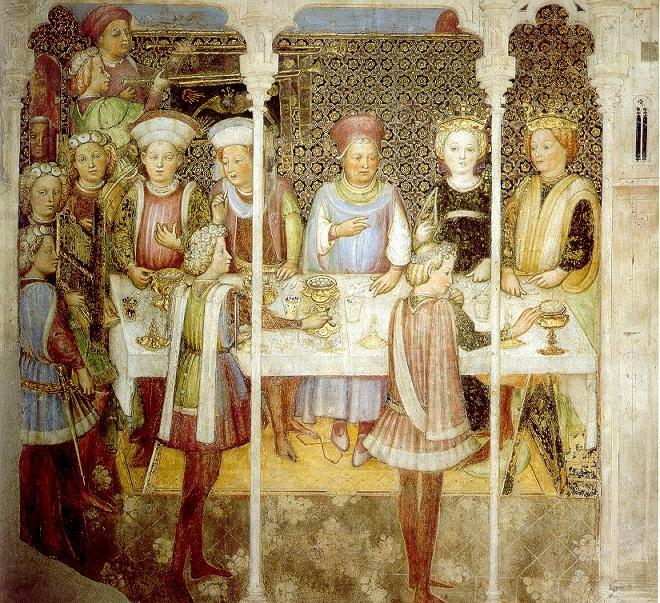 Otherwise, she was important for her familial connections: Barbara von Cilli had a powerful father that Sigismund wanted on his side. As it happened, the most important early person corresponding to the card (especially the PMB), Bianca Maria Visconti, was only a duchess, and not even a legitimate one at that, in the eyes of the nobility of Italy and all Europe. 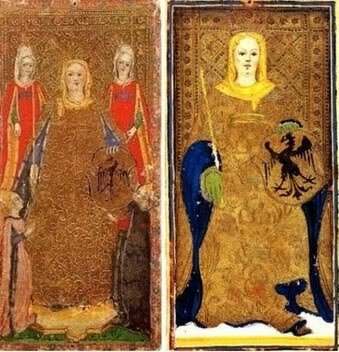 So perhaps the shield on the PMB card (and maybe even the CY card, if it was produced after Bianca and Francesco’s return to Milan, modeled on a lost deck from Filippo's reign) proclaims to the Sforza children their birthright, which it is their duty to raise above her own illegimate birth. 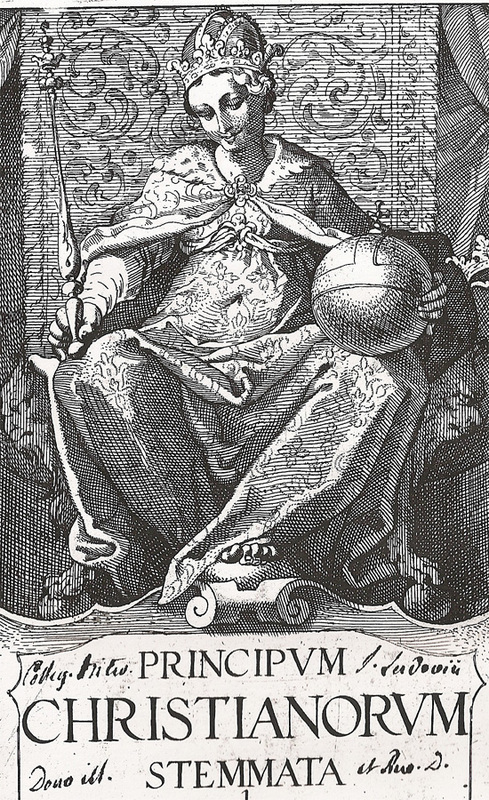 That goal was eventually achieved by her son Ludovico, who successfully arranged a marriage between the Emperor and his niece, also named Bianca Maria (engraving below left, from http://aeiou.iicm.tugraz.at/aeiou.encyc ... ANGUAGE=en); thereby (although in a separate ceremony, and requiring the death of a nephew) becoming a real Duke himself in 1495. So of course the shield gets displayed again, alongside the triumphant if naive Empress of the Cary Sheet, the eagle shield, as well as the young empress, strongly suggesting Milanese derivation, probably shortly after this date (but see the Cary Sheet thread for other views). The Cary Sheet Empress is then the model for the Noblet and other "Marseille" type Empresses.